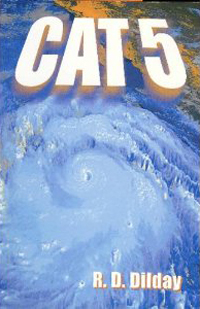 Randy De Armond Dilday's novel Cat 5 (2004) is a thriller about severe weather. A hurricane threatens an American city but advance warnings are mysteriously withheld. One man suspects foul play and risks everything to expose the truth. Storms, Dilday said about his book, "have a universal fascination for people because they are an archetype of life, motion, yin-yang, a vortex of opposing forces, a point of origin.” Dilday, who passed away in 2011, was intrigued by the natural world and even learned about paleoclimatology to write the novel. However, he maintained that he was most interested in how people respond to the challenges they face - and it is the human element which lies at the core of his novel.